I'd ordered the kit from BirdofPrey (www.balsabuddies.com) and it arrived today. Bob's notes to me about the shipping charges for two kits (SeaDart and BD-5) mentioned getting the two kits into a single package and mentioned pizza boxes. Now I understand. Package is 41 inches x 19 inches x 2 inches, and is composed of two taped together but totally new generic pizza boxes. Upon opening the package and removing the sheets of advertising material, I found three sheets of quarter inch foam that had been lasercut. The cuts were approximately one-eighth inch wide with small connectors to the main section of the sheet to keep the bits and pieces in place until you cut them. No instructions or diagrams or plans. Fortunately, the above link covers the plans (got two copies printed so I can make spares as needed) as well as the building sequence, plus options and such. Currently, motor is going to be a RCTimer 2812-06 brushless (same as one of the suggested motors for Formosa racing), their 25-amp speed controller, and using the parkflyer rx for my SPektrum DX6x radio system. Got lots of micro servoes, and 1300 MAH 3S lipo packs (intended to use as well in the SuperCub). Glue is the foam stuff that Pinnacle Hobbies had piles of at the Aurora Swap Meet a couple months ago. Apparently, this is beyond "a dab'll do ya" compared to Gorilla Glue -- easy to put down too much when putting very little down. Going to have to practice on the scrap foam pieces surrounding the parts in the kit. This week saw me start the kit. 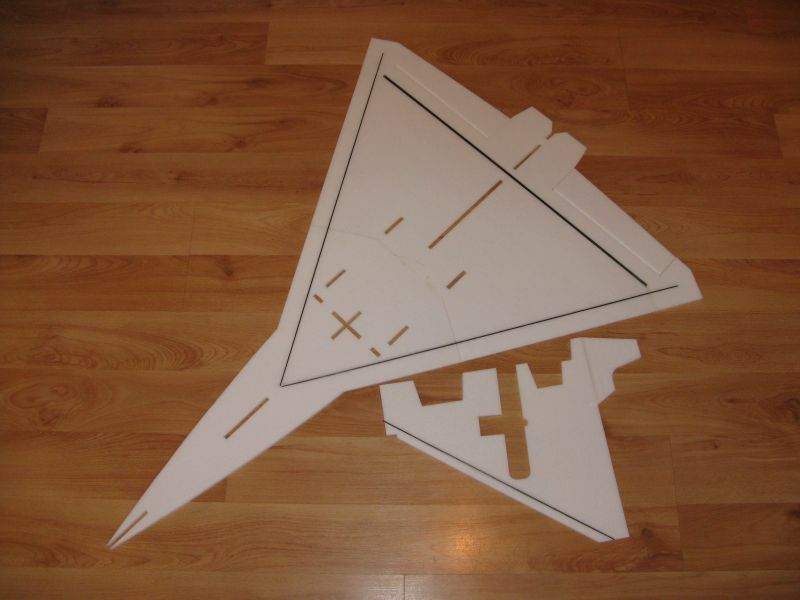 I found the three major wing/keel sections plus the fin. I'd noticed small holes about 3mm in diameter in the back end of the wing section as well as the rudder. Looking at the above picture, I realized what they were there for: in the rudder, it's to mark the slot for the 3mm CF tube or the strip (make sure that you cut it appropriately for which method you're using. In the wing section, it's the outline of the elevon sections. Right now, I'm waiting for the epoxy to set. I did notice that the joint between the rearmost wing sections forms the slot for the 6mm CF tube/spar. A bit flimsy since there's about three inches total length that is glue joint (not counting the foam-Cf-foam joint). Will let it sit for a while to see if the foam-to-foam joint solidifies. BTW, I'm using the all-foam glue thaqt Pinnacle Hobbies was selling at the Aurora Swap Meet this spring. I was told "a dab'll do ya" (old advertising line) but it's what I've been using -- thin layer on one surface, push the other side up against , slide a bit side-to-side and let sit. End of May and not much progress. Horizontal keel together and fin setup done. Jus installed the servo and water ruddre and got the linkage set up. going to step back to the SU-29 that I have on the back counter and use the same micro-EZ-connectors to mount the wire to the servo. Good idea as getting the Z-bends on both ends of the wire right is a pain -- not enough practice, and practice is expensive because I have to use good wire to play around with. Motor in place with prop but slightly less up-thrust than the plans call for. Elevons trimmed, sanded and ready to put into place as soon as I find or buy Dermablend cloth tape (got half a roll somewhere in the basement but have absolutely no idea where it is....) then start on the fuselage bottom. Colour scheme will be standard RCN 1950/60s pattern used on the McD Banshee operated off the Bonnie (HMCS Bonaventure). Sorry, Canadian Navy Brat (grandson of a Royal Marine) so you can see where my default setting is. Aaron, this is the thread and the first posting has the kit manufacturer. Think that this is what you were looking for. While at the Sun n Fun museum in Lakeland Florida last year, I took some pictures of one of the few Sea Darts left intact. They have it amongst the aircraft in the outdoor display as you come up to the entrance to the main museum building. The curator told me that one of the main unresolved issues was landing in choppy to rough water. There was no suspension on the skids and many pilots sustained back injuries landing the odd unit. It certainly looked cool. I thought I had more pictures than I did. Lily took a few but this was the only full size shot she took. Take care. Resurrecting the kit to get it finished, hopefully even fly it this winter off of the snow. Currently have a question on where to put my receiver (Spektrum AR610), especially with the intake being open and the possibility of water splashing in). |Comments and suggestions? Next question is how to get the pushrods for the elevens done -- what diameter for the wire and can it be done in two pieces per side and would I need a middle guide to keep the wire straight?